San Antonio’s newest art installation is under Interstate 35. Hundreds of cars roar by each hour overhead. Their wheels create a steady throb filling the space below the interstate at Quincy and St Mary’s streets. But the noise and wind don’t faze Kelly Edwards as he shadows crests of blood on his 20-foot mural with a spray can. Kelly Edwards is one of 20 artists filling 16 pillars with murals. “That’s like the sacred heart of Mary and there’s blood kind of dripping from the heart into a chalice and it’s all kinda set in a deserty scene,” he said. The professional artist and owner of Eternal Courage Tattoo shop have a lot of work to do if he wants to finish by opening night. The project is the coming-out party for the San Antonio Street Art Initiative, a nascent nonprofit that wants to encourage the city’s street art scene and give it legitimacy. The event begins at 6 p.m. and features music and food trucks. Edwards is one of more than 20 artists filling the surrounding massive interstate support columns with art. 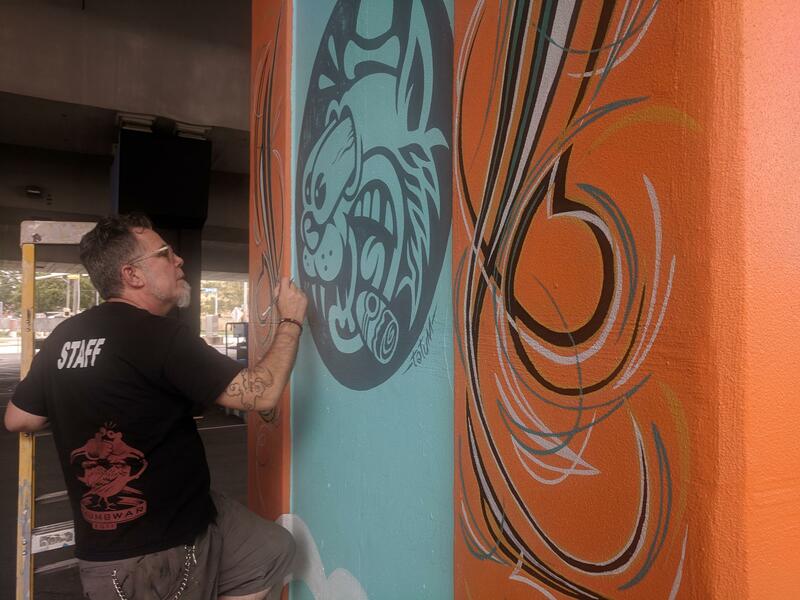 Shek Vega organized the event and is forming the San Antonio Street Art Initiative. “Whenever I was in an art setting and people would introduce me they’d be, ‘He’s a great street artist,’ and they would do the motion with the hand and people would automatically dismiss it and associate with the taboo that is street art,” he said. 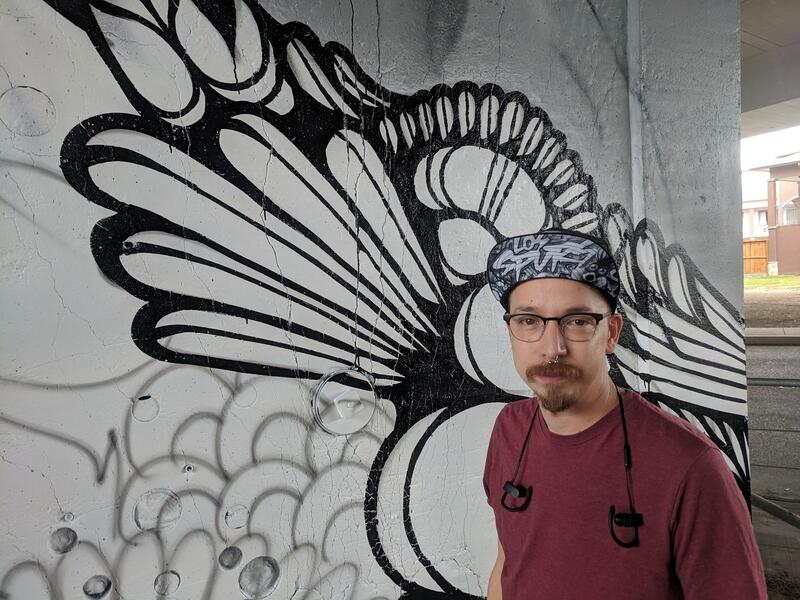 “And we wanted to change, we wanted to showcase that,” said David “Shek” Vega, who organized this exhibition and is one of the driving forces behind the street art initiative. Vega and Nik Soupe run Los Otros Murals. 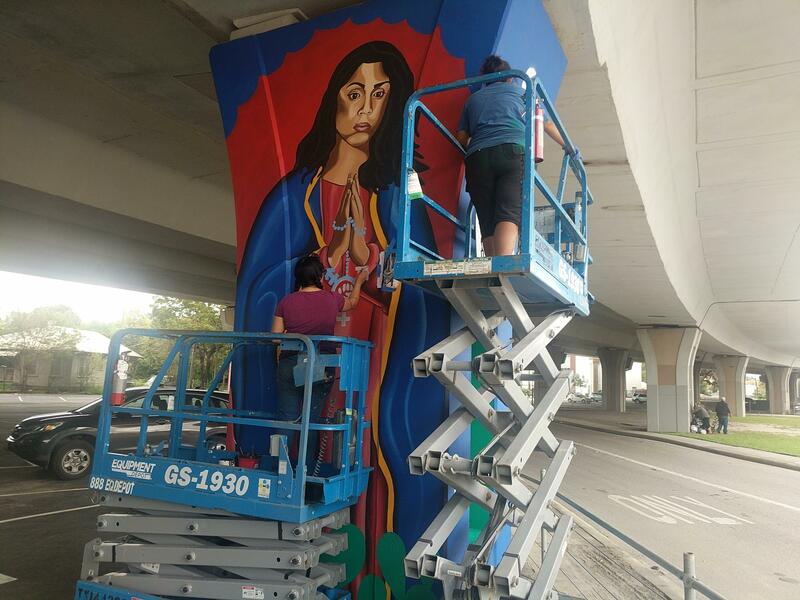 Together, they convinced prominent San Antonio artists, including Cruz Ortiz, Alex Rubio, Robert Tatum, and Andy Benavidez to recapture this public space by painting 16 highway pillars. This parking lot is leased by a local developer. It’s surrounded by a residential neighborhood, a Super 8 motel, and infrastructure overgrown by weeds and grass. Suzy Gonzalez and her sister work on their murals. “From these really dingy beige pillars that we pass by every day on our routes (to) all of a sudden become this attraction that makes you turn your head — that make you want to take your time and visit,” he said. The Greek god Atlas spans the top of Vega and Soupe’s pillar. He’s holding up the freeway instead of the Earth. Vega stooped below, brush in hand, creating black ornate designs. He, like many others working this week, was delayed by storms that kept paint from drying. 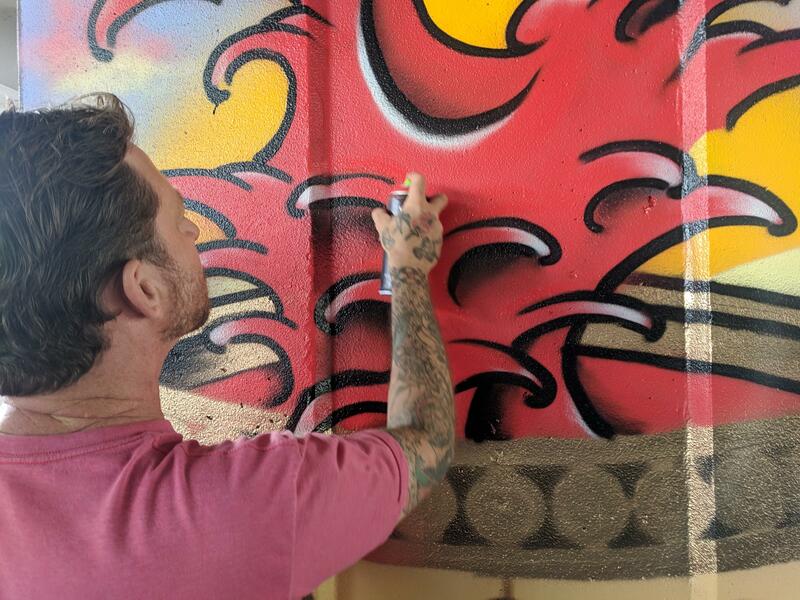 “We also get the disgusting runoff that comes off the freeway so a lot of it drips down on some of the artwork and unfortunately some of the artists as well,“ he said. Nearby, another mural features two locals including musician Polly Anna Rocha depicted as the Blessed Virgin Mary. Justin Parr is 10 feet up on a scissor lift. The owner of Flight Gallery created an explosion of colorful patterns. Parr says it’s been thrilling to be surrounded by so many talented artists, and the elements haven’t dissuaded him — be it rain, the hundreds of bats that fly through at dusk or the surrounding homeless population. People keep coming up and asking him: “So uh, are you all gonna do uh those down there and those down there because there’s a whole bunch more,” he said. 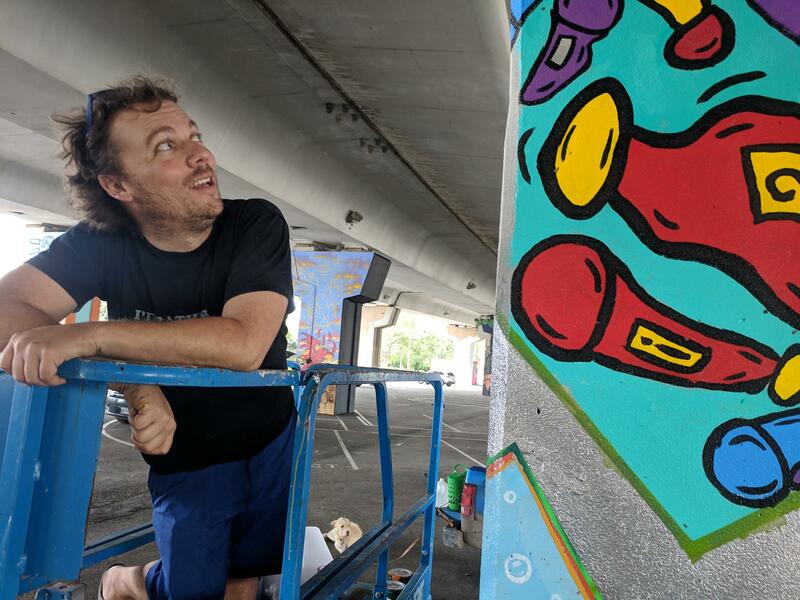 Parr might get the chance since the street art Initiative wants this to be the first of many projects, but with one sticking point: TxDOT owns the pillars and says they were never contacted about the project. Vega said he got the permission of the developer leasing the property. A TXDOT spokesman said in a statement they want to be supportive and these are visually stunning murals, but TXDOT wants to be contacted before any more columns get painted.